The Bust half dollar value for a coin in "Good" condition is at least $45 to $47 each. Your coin is very popular, intensely studied and highly valued. $47 is the just the starting value for the more common Capped Bust variety minted from 1807 until 1839. If you discover you have the earlier Draped Bust variety dating from 1796 to 1807 the value is $135 or more per coin. Of even greater value, well preserved coins in higher grades above the "Good" grade have the potential to reach hundreds of dollars in value. Because of condition, the stunning uncirculated Bust half dollar pictured, at auction, would reach over one thousand dollars. Here is an interesting coin, turn up an 1839-O, and its value is $475 in Good condition. With the bulk minted in Philadelphia, it has the distinction of the only collectible business strike Bust Half minted in New Orleans. Find the "O" mintmark just above the date. 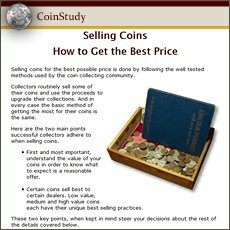 Judge the condition of your coins accurately. Other than date what affects your Bust half dollar value the most is the difference from one grade to the next higher grade. How to grade your coins is covered in more detail below. If your coin is not listed above, it is seldom encountered. For additional reference... NumisMedia publishes an extensive fair market value price guide, covering retail Bust Half Dollar Value in detail. What can have a dramatic effect on your Bust half dollar value? The condition of your coins is a huge issue with collectors. They place large premiums on better "Grade" coins. Heavily worn coins are assigned lower grades with corresponding lower values. Now for the best. 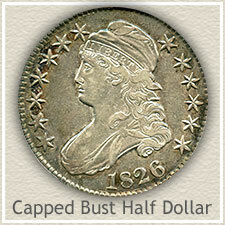 Early Bust halves exhibiting crisp, sharp details with little or no wear are avidly sought by dealers and collectors. From one grade to the next higher grade, values jump accordingly. 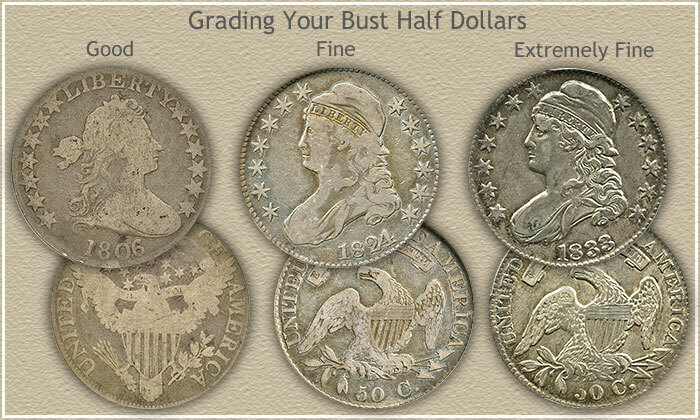 To accurately assess the value your coins, first separate them by grade by using the grading images... next consult the Bust Half Dollar Value chart. Still need help? If you feel any of your coins, because of condition, are worth over one hundred dollars and you are just not sure. There is help with grading. It is also helpful to know grading a coin is not an exact science. It is your opinion, dealers and collectors have their own opinions... and they can all differ slightly. One thing you can do. You have the ability to easily compare your coins to others. Check a few rare coin dealers and auction listings, look for those offering Early Halves for sale, their listings and prices usually include a notation of the NGC or PCGS assigned grade. Additionally... these coin dealers are potential buyers of your coins. Early halves contain a fascinating history, consider your group of coins as the beginning of a coin collection. The start of an enjoyable and rewarding hobby. If that is not for you, one successful approach is to sell all your coins and use the proceeds to buy one nice rare coin. The one you were hoping to find in the box. Pass the thrill of a rare coin on to your children. Your old coins are treasured by dealers and collectors. To find a rare date is certainly a thrill. More realistically, you stand a better chance of finding a higher condition coin with higher value. The condition of your coins is a very important part of determining value. The above Bust Half Dollar Value chart clearly separates the rare dates and varieties showing the coins worth investigating further. Keep in touch, return whenever curious and discover how much your early half dollars are worth. Discover the value of all your old half dollars. 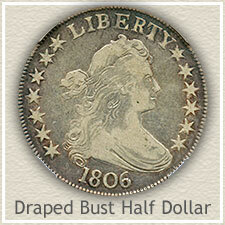 From the very first Bust half dollars to Seated Liberty to Barber halves. Continue to the Walking Liberty and Franklin Half dollars. Compare your coins to the "Grading Images" and find their accurate value on the charts. Print the Coin Values Worksheet - link in navigation column - to list your Bust half dollars and record their values. Should you decide to sell... use the worksheet as an invoice and packing slip when sending coins through the mail to dealers. It indicates you have done your coin values homework.